How much do we rent it for? Who should live in it? Do we manage it ourselves or hire a professional? As with a lot of things, we might not know the answers up front. But failure isn’t an option, so we tend to figure it out. Usually on our own. But when it comes to owning a rental property and figuring out your taxes, you shouldn’t do them on your own. You should hire a tax professional, such as a CPA or enrolled agent, who focuses on tax preparation and tax planning. While you can have your taxes prepared by a service such as H&R Block, you should be aware of two things. First, many tax preparation services share your information with third parties, so be aware of the fine print when you have them do your tax return. Second, tax preparation services do not perform tax planning with their clients. On the other hand, a tax professional should not only help you make sure your tax return is filed properly, but help you minimize your tax bill. Doing your taxes yourself might save you some money up front. But in the long run, it could cost more than hiring them out to a tax professional, even if you’re used to doing them on your own. Here are three reasons why. Reason #1: Deductions are different under Schedule E.
When you own a house, you might itemize your deductions under Schedule A. If that’s the case, you may be familiar with what is deductible as a homeowner’s expense or what is not. 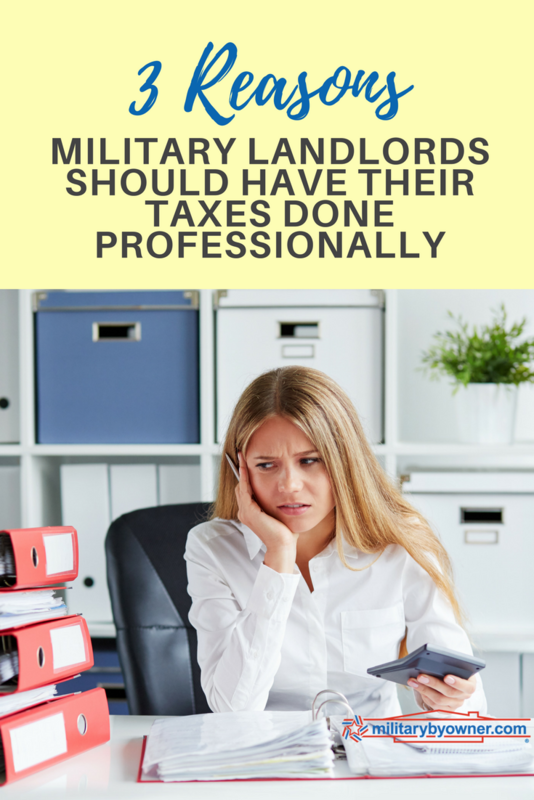 However, when dealing with a rental property, many of these deductions are different. To properly minimize your tax liability, it’s important to clearly understand those differences. For example, your homeowner’s insurance usually isn’t deductible on Schedule A of your tax return. But insurance on your rental property IS deductible under Schedule E. There are similar differences in the treatment of mortgage interest, real estate taxes, and other expenses. All of these could have an impact on your tax liability, especially if you aren’t aware of them. One of the most important deductions is depreciation expense. The IRS allows certain property, such as rental real estate, to be depreciated over a certain period. In doing this, the property owner doesn’t pay anything, but is able to lower their taxable income by the depreciation amount. This results in actual cash savings. On the other hand, when you sell that rental property, the IRS will expect you to ‘recapture’ that depreciation and pay taxes on it. This happens regardless of whether you actually took the depreciation expense deduction while your home was rented out. Therefore, understanding how depreciation is calculated is extremely important. Reason #2: Calculations can be trickier than expected. Understanding deductions and properly calculating them are two completely different things. For example, it’s easy to guestimate how much depreciation is. But it’s harder to get the exact figure. Which one would you want to see on your tax return, close enough or exactly right? Let’s say you’ve got a rental property valued at $275,000. If the IRS allows a depreciation schedule of 27.5 years, then you should be able to deduct $10,000 per year in depreciation ($275,000 ÷27.5), right? Probably not. If you were deducting the total value of the property, you probably forgot to take out the value of the land. Land doesn't depreciate, so you can’t deduct for that. Then, you’d have to figure out how much value is in the land versus your home. There are many factors that go into properly calculating something as seemingly simple as depreciation. Of course, tax software has made things a lot more user-friendly. But one thing that hasn’t changed is user error. If you make a mistake, your tax software probably won’t catch it. And you probably won’t catch it either, if you don’t know what to look for. Fortunately, a professional tax preparer should be able to ask the right questions and get the right information from you. That way, they can properly calculate your tax liability. Reason #3: You should focus on the highest and best use of your time. Tax season is at the same time every year. But deployments aren’t. PCS moves aren’t. All those things that you can’t even put on the calendar like exercises, workups, TDY assignments; they happen all the time. Even if you file an extension, you’re going to have to do your taxes at some point. And when it comes time to do your tax return, are you sure you’re going to be at the top of your game? What happens when you try to deal with everything on your plate AND your taxes? Most likely, your taxes will get short shrift. Not good. Spending a little more time as a family before deployment. But you can hire your taxes out to an expert who will help you minimize your tax bill. The highest and best use of your time should be doing all the things that make your military family special. Taxes probably isn’t one of them. Every military family has significant challenges. When your home becomes a rental property, there are so many decisions to make. Sometimes, you must keep costs as low as possible. But don’t shortchange your taxes. That decision could end up costing you.